I recently visited my friends at The Holistic Studies Institute in Albany, NY for an evening workshop about Kirlian photography. As usual, everyone there was fantastic and an absolute joy to be with, but that night was about their special guest, Al Hulstrunk and his Kirlian device. What is Kirlian photography? Well, it involves what is probably very basic science, but since I stink at even the most basic scientific explanations, please forgive this totally lackluster explanation. 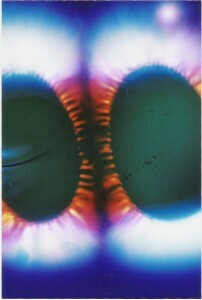 Essentially sheet film is placed on top of a metal plate and the object to be photographed is placed on top of the film. High voltage is applied to the plate to make an exposure. The corona discharge (A type of electrical conduction that generally occurs at or near atmospheric pressure in gases.) between the object and the plate passes through and is recorded onto the film. This creates a photo of the object with all kinds of cool colors emanating from it. That’s about as much science as you’re getting out of me, that paragraph was really hard for me and I’m not entirely sure I understand what I just said! Now that you know what it is, I guess the next question is who cares? Here is where I can start talking a little bit more in my comfort zone. If my husband was writing this article, which he considered doing; it would probably be 80% science and 20% philosophy. Since it’s me, we’re looking at 90% philosophy and 10% of the crappiest science ever put to paper. So who cares? Well firstly, not too many people do care. Hulstrunk told us that Kirlian photography’s heyday was the 1970s. The technology is at an understandable stand still, more about that later when I get my totally sappy groove on. There had once been a large international community that studied the results produced by these devices, but these days it’s slimmed down to photography enthusiasts (the pictures produced can be very beautiful) and paranormal/psychic researchers. We now know what Kirlian photography is and the people who care about it. This brings us to why? It’s just a bunch of colors on a photo, right? Well, yes, it is. It’s what these colors may signify that causes the interest. There are many paranormal claims made in conjunction with these devices. Some have claimed that the use of Kirlian photography can predict illness or disease in plants and animals. There is the famous “phantom” leaf claim. Many experimenters have claimed that if they take a small part of a leaf and photograph it the rest of the leaf appears with it in developed photo. But these colors provoke other questions. Could there be a link between the colors and patterns produced and the chakras, the acupuncture points, astrological influences, psychic abilities, etc? Many people believe there is, and that the answers lie locked in that photographic image waiting to be interpreted like a Rorschach ink blot. This is awesome, right? So why isn’t there stuff about Kirlian photography everywhere? That’s the real problem. Standardization. Obviously for science you need to be able to get consistent results in order to prove results of experimentation. But these aren’t scientists at H.S.I., they’re psychics, don’t they just believe? Well, they do, but without uniform results even a room full of psychics can’t be certain what secrets are hiding in a Kirlian photo. Without a standard baseline, or control, how can anyone be certain what is happening in any given Kirlian photo? The gang at H.S.I. doesn’t let that dampen their spirits, they do what they can. Each person present had a Kirlian photo taken of them and logged. This was just being a person standing around. Then, people went back through and had a second photo taken after doing something that could provoke a change. One person went all day without coffee, God bless her, and then had her photo taken. She was then allowed to have some yummy coffee, and then they took another photo. People used Reiki or Therapeutic Touch on each other. One daring woman put her hand in melting snow for as long as she could stand. A crowd pleaser was the woman who boldly knocked back a few swigs of vodka, in the name of science. For me, my second “activity” photo was me with my husband. We figured it was lower impact than a lot of the things people were doing. Once the film is developed, the folks at The Holistic Studies Institute will compare before and after, and see if there were noticeable changes. This lack of control with Kirlian photography is causing it to become a dying art form. Because of it, the scientific community, which was never in love with it, has now totally abandoned it. Due to the prevalence of digital photography, finding film is starting to become challenging, and costly. Hulstrunk told us there have been no notable advances in the Kirlian field since the 1970s. There hasn’t been any new blood to push the envelope of exploration.